At Enrique Tomás we are ham lovers and defenders and when we state that a piece can be considered the best ham in the world, it is because behind it there is experience, commitment, humility, work and a lot of effort and care. This is how the idea of the Glamurós ham was born and we want to make it known worldwide. 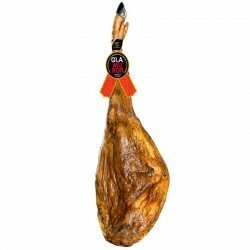 The Glamurós Ham is a 100% Iberico de Bellota Ham that has been selected by our team of artisan experts, who, after many controls, can prove that it is not only a product with unique characteristics, but also that it is at its best curing moment. You've never tasted anything like it! At Enrique Tomás we are always looking for excellence, since we always work with the highest quality standards. For the fact that we have the advantage of having the control and care of thousands of 100% Iberico de Bellota hams and ham shoulders, we have the possibility of discovering exceptional pieces; pieces that stand out from the rest and deserve undoubtedly different treatment due to their characteristics. What to do when a product, from the earliest stage, has unique qualities? Our expert ham producers know it well, these types of pieces are removed and taken care of to get the most out of their natural conditions. It is then that the best hams and ham shoulders are labelled with the Glamurós label and offered for sale at the best moment of consumption. If you are wondering why Enrique Tomás' Glamurós Ham is the best ham in the world, the answer, although complex, is very simple to understand. The 100% Iberico de Bellota ham is in itself a product of the highest quality, an emblem of Spanish gastronomy worldwide... considered the best of the best, so can there be anything of superior quality? Well, imagine if, in addition to being 100% Iberico de Bellota, we tell you that this ham has the best possible characteristics: impeccable and exceptional shape, perfect aesthetics, perfect curing time; That’s right! this is the Glamurós Ham! Sachet of 80 grams - Elegant sachet with ham cut with a knife. Remember that this is not just any product but the best ham in the world. Enjoy at your own pace extraordinary and vacuum-packed slices. Whole piece (ham)- The best ham in all its splendor, a unique piece weighing approximately 8 kilos that you can exhibit at home while enjoying and sharing an extraordinary product. Whole piece (ham shoulder) – Just like ham, the ham shoulders can also have superb characteristics. These pieces weigh approximately 5 kilos.